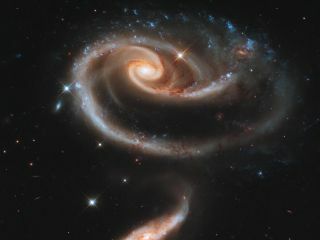 To celebrate the 21st anniversary of the Hubble Space Telescope, astronomers pointed Hubble's eye at an especially photogenic pair of interacting galaxies called Arp 273. A whirlpool-like spiral galaxy is being distorted by the gravitational pull of a neighbor in a new photo from NASA's Hubble Space Telescope. "For 21 years, Hubble has profoundly changed our view of the universe, allowing us to see deep into the past while opening our eyes to the majesty and wonders around us," NASA Administrator Charles Bolden said in a statement. "I was privileged to pilot space shuttle Discovery as it deployed Hubble. After all this time, new Hubble images still inspire awe and are a testament to the extraordinary work of the many people behind the world's most famous observatory." The new Hubble picture shows a pair of interacting galaxies called Arp 273. The large spiral galaxy at the top is known as UGC 1810. It is being pulled apart by the tidal gravitational forces (similar to the tug of the moon on Earth) from its companion, the smaller galaxy UGC 1813. This picture was taken in December 2010 through three separate filters by Hubble's Wide Field Camera 3 (WFC3). The filters cover various wavelengths over the ultraviolet, blueand red portions of the electromagnetic spectrum. Arp 273 lies in the constellation Andromeda, roughly 300 million light-years away from Earth. The two interacting galaxies are separated from each other by tens of thousands of light-years.